All photos by Dean Igoe. When guys named Francesco and Marco invite you into their restaurant featuring Southern Italian and Mediterranean dishes how can one refuse? So, we headed to Mast', through the dark back streets of Downtown Boston, following the crowd. The place is full. The twenty-something couple ahead of us discover that without reservations it's a thirty minute wait for a table. So far, so good. 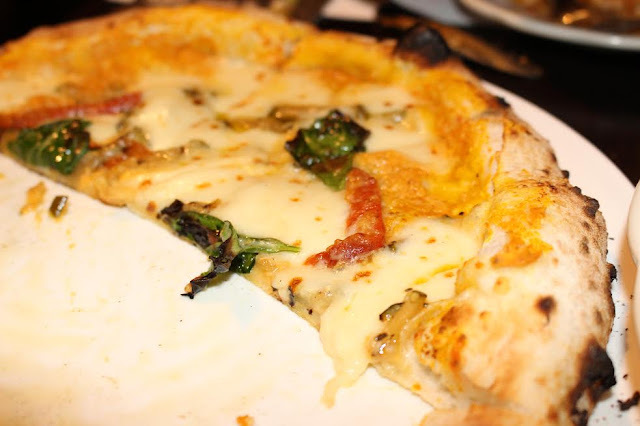 We sip some Sangria and try some of the Neapolitan pizza they have made a reputation on. After ninety seconds in the blasting oven the thin crust is near perfect. They call it Zucca: Pumpkin Squash Creme, Fior di Latte, Spezia. It's full of flavor and textures and done well. The Lasagna, Francesco Gargiulli, Executive Chef explains, has very thin layers of pasta (all made in house) and is heavier on the meat and vegetables. With cheese, peas, ground beef, gravy, it's almost like an Italian version of Shepard's Pie. I like it. The crowd is lively. A singer just a few feet away is crooning what is basically the Frank Sinatra songbook. What a perfect way to unwind on a Friday night after a hectic week. 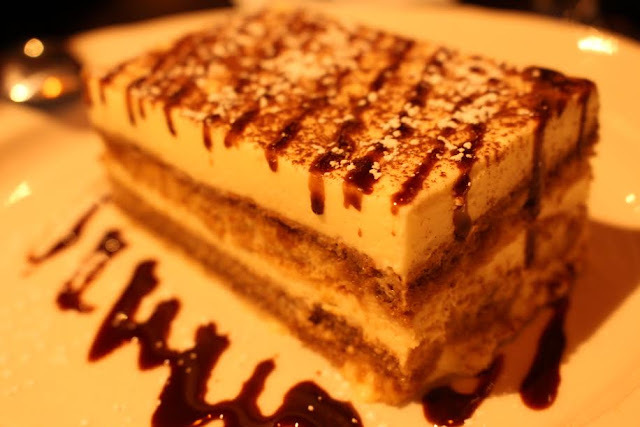 Then there is the Tiramisu. Rich in flavor but not too heavy. 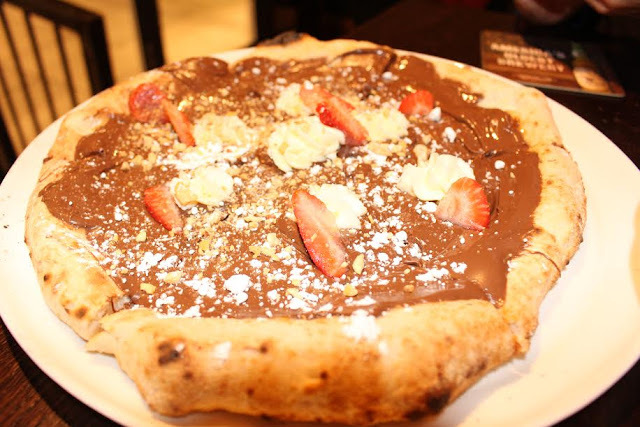 But the dish we came for was the Dessert Pizza, that crispy crust, a layer of Nutella, dobs of cream and strawberries. If you love Nutella (and who does not?) then it's the perfect sweet finish. The menu offers so much to want that it might be daunting. Just do what we did and try anything. Then, you'll want to go back and try the rest. Who's There: Lots of young couples, larger tables of single ladies and young professionals in phase one of a fun night on the town, older couples who seem to just enjoy great regional food, the cast of characters one might find in that unusual spot that draws the diversity of those fleeing the Financial District for the weekend, Back Bay stalwarts, Primark/H&M shoppers and an occasional theater starlet. Perfect for: Old friends, new friends, casual dates, breaking out of your usual geographic routine or we-all-work-in-the-same-area-so-let's-go-here troop movements. 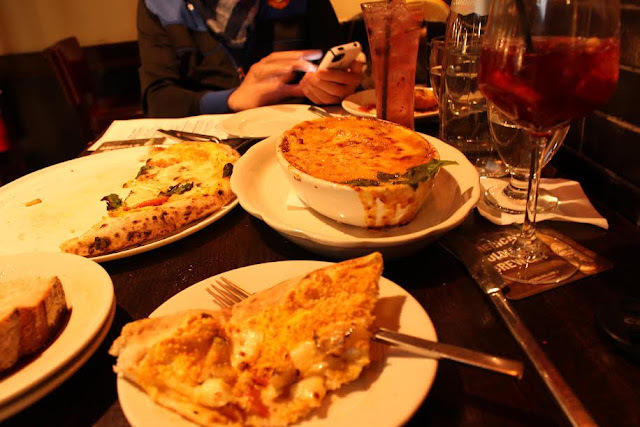 Favorite things: The cocktails, the pizza, the pasta. What we'd tell a friend: It's like going to a restaurant in Italy where the family that runs it really wants you to enjoy the food and have a good time. Great place to go if you don't want the cookie-cutter experience of a slick chain. Be adventurous.